If somebody had asked me this question a year ago, I would have answered them with a pretty self-assured “no”! As a believer in the afterlife and the paranormal I have seen some pretty convincing evidence as to the existence of ghosts of course… but Tinkerbell? Fairy’s, Faerie, goblins, elves, nature spirits. Call them what you like (more on this later) but no – I believed that silver winged little folk are nothing more than the creation of over active imaginations and the superstitious folklore of our ancestors. But are they? Just recently I wrote an article for my local paper about the folklore in the area I live in Clydach Gorge South Wales U.K, a magical place said to have inspired Shakespeare to write “A Midsummer Night’s Dream” and it got me thinking. No physical evidence of fairies has ever been confirmed to exist, although there are many photographs and accounts, most of which seem to be hoaxes as we have come to expect in the world of supernatural, so despite the stories and eyewitness accounts, why do so many people still believe in them? And why is the proof as to whether they did or still do exist remain teasingly at arm’s length? If you were to research how far back people believed in the existence of fairies, or as I prefer to refer to them as, “Fae”, then you will find yourself going back in history for many centuries, possibly even before time was recorded. In Irish history it was suggested that a race of beings called The Formorians existed before humans and they came in many guises. Ancient text from the middle east also tell of a race of beings that lived in the world before humans and they believed they were banished to another realm out of our sight, these were known as The Djinn (Arabic word meaning hidden. The little folk are an integral part of American Indian folklore and indeed in many cultures all over the world have their own versions of “being” all of them with startling similarities. The Victorians of course made the traditional image of the fairies popular and this is where the depictions of them being beautiful winged flower fairies perhaps comes from. So what are Fae? How were they described by those witnesses? Most of you will already have an idea in your mind’s eye as to how they look however a close study of the fairy lore around Britain and Ireland seems to reveal that they actually differ from area to area. Some may be described as tall, some minute however the general consensus seems to be that they are like small human about 4 feet high, and to complicate things even further, it is believed that some have shape shifting ability and can choose how they appear to you. Clothing has been noted as well and they can be dressed in all colours, cloaks and hats and capes have also been seen often they have a “scruffy” appearance. Many eye witness accounts describe simply seeing strange lights and in a book written by Janet Bond “Fairies – real life encounters with little people” she examines the close similarities between UFO sightings, Angels and Fae. Let’s for a moment just forget the many terms and names we give them, and consider, could ALL the phenomena we are hearing about worldwide, including some possible things put down to ghost sightings, actually be one and the same thing? It is an interesting concept that author and scriptwriter and Ghost Hunters International star Barry Fitzgerald also has spent recent years researching and he believes that the broad spectrum of names given to the little folk – aliens, fairies elves could indeed be describing the same thing, and that undeniably makes their existence far more widespread than you might imagine. Where can we start to look for Fae then, where do they exist? There are many pre-historic sites, earth mounds, cairns and forts that were believed to have been doorways to the underworld where the Fae lived underground which would be a good place to start, as strong links with the realm of the Fae were suggested here. Often even named after the folklore surrounding them, there are many Fairy Hills or Fairy Mounts, possibly because these were burial grounds and fairies were believed to have been the spirits of the departed. Lewis Spence, a Scottish journalist, poet, author, folklorist and occult scholar, explained in his book “British Fairy Origins” that the ghosts of the dead were believed to dwell in the standing stones which marked burial places and he gave numerous examples of the association between Fae and these ancient stones. Another dominant theme however in the theory about Fae is that they are often helpful to us humans (miners believed in hobgoblins for example that would guide them to coal and help with their little pick axes) however they also have the potential to be wicked and malicious and would retaliate should their sacred territory be interfered with. Also forest and woodlands protected by the woodland association with trees that grow across pathways and protected species of plants are a very good place to begin your search. A word of warning however. It is widely recognised that people should not attempt to follow Fae into these dwellings and also that one did not destroy or alter in any way their surroundings, especially trees thought to be associated with the Fae including hazel, blackthorns, elder as the consequences if you did would be terrible. I was honoured and excited to be included in a weekend with Barry Fitzgerald, along with my sister and partner in crime Linzi and a small team of people to join in with an exciting new project called Legend Seekers. In Ireland we were to visit an ancient hill fort called Knocknashee Common to investigate the many sightings of Fae in the area and have to say it has completely changed my entire perception of the paranormal and opened my eyes to the possibilities that yes Fae indeed do exist in our world. This is an extract of my account of the weekend as I have written for The Abergavenny Chronicle, and take from it what you will, however remember this. We are only limited by our own perceptions. “In his book “Searching The Sidhe” (Sidhe pronounced Shee – an old Irish term meaning fairy, hill folk or other world being) Barry demonstrates the common threads that exist in the folklore of cultures all around the world, and he explains how the stories passed down to us from our ancestors, the clues that they left us via cave art and ancient testaments, the symbolism carved into stones and the wisdom they left us, and has become lost. Our world of technology has depleted our senses and created a distraction to the possibility of another realm, yet the likelihood still remains that these strange beings or entities whom enter our world via a thin veil from another dimension exist to this day… and the signs are still here for those that are willing to look. As we boarded the plane at Bristol airport we were filled with anticipation, not knowing what to expect. Our paranormal journey so far has taken us to many exciting locations within the U.K but has always been principally about proving the existence of ghosts and the afterlife. The idea that we were now going to be looking for Faeries was new to us both and I have to admit, I didn’t know if I really believed in them, yet here we were, about to be camping for two nights in whatever weather the Irish sky had planned for us, in ‘Knocknashee’. 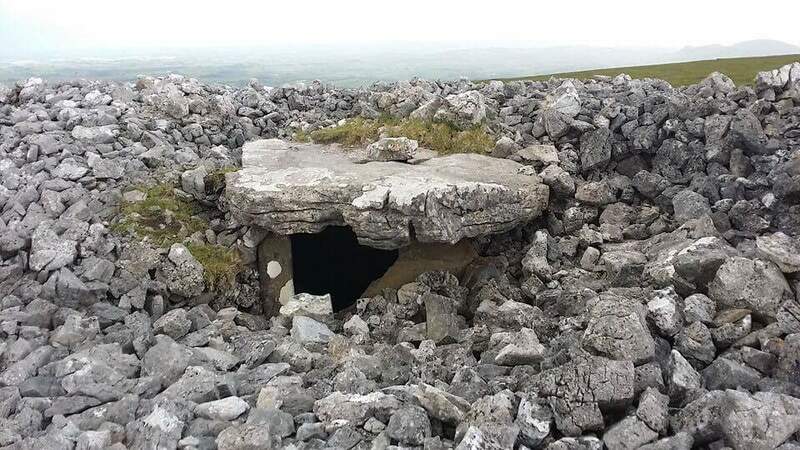 Situated in the Ox mountains in County Sligo this is a former Neolithic hill fort which has the remains of approximately 38 buildings and two cairns (three if you count the one that appears and disappears according to local stories). Reports of strange lights and tales of the Fae first drew Barry here to investigate two years ago and his findings were so startling he wrote about the experiences in his book. After landing in Knock, we hired a car and set out with our ‘just under 15k” baggage allowance – no hair straighteners allowed on this trip! I remembered apprehensively that we were asked to sign a waiver of liability which included the phase. “I wouldn’t laugh” he replied. We arrived at base camp – Gillingham’s World, which is a tourist attraction owned by Melody Urquhart, who closed the park for the weekend and joined us with her pug cross Evie. Melody is a wonderful lady whose passion for her Irish inheritance has seen her painstakingly transform the land around the hill into a magical place with an enchanted glade, picnic areas and botanical gardens all filled with faerie statues. It hardly seems the place for anything darker than Tinkerbell and her cute friends and I couldn’t have felt less afraid at that time surrounded by the delights of fairyland. We were joined by Barry’s lovely wife Donna and his faithful dog Max, best friend and fellow investigator Damian Denver, as well as a handful of other likeminded guests, and we bonded quickly as a group. Relaxed by the company I felt only positive anticipation as we began the investigation by hiking up the steep hill to the top of the fort, just before night fall where activity is said to be at its height. It seemed surreal as we were met by the most stunning full rainbow which ended right there at the top of the hill surrounded by panoramic views of the most stunning scenery. Nobody could fail to be enchanted by all this and it occurred to me that should a few leprechauns appear out of the hillside and begun to dance it wouldn’t have surprised me at all right at that moment in time! As a paranormal investigator, I usually carry plenty of manufactured equipment with me, spirit boxes, K2s, cameras and Mel meters, technology created to capture evidence of those other worldly things. This time however we were told to simply observe. Not interested in arguing and trying to prove our findings with closed minds any more, we left behind the devices gadgets and gizmos and practised using only our natural perceptions. I then witnessed what I thought maybe were child sized people popping their heads up and down on the horizon, always just within my peripheral vision, however until another member of the party also commented that they were seeing the same thing I had written it off as “tricks of the light”. The group then split into two and as we remained stood on one cairn, four went to examine the second Cairn about 200 yards away. They remained within sight as they walked away from us getting smaller and smaller whilst the weather closed in on us escorted by the darkness, throwing rain and a bitter wind into the mix. After about half an hour, the two members of our group who were facing the second cairn commented that the other group must have moved very fast as they were now walking towards us from an entirely different direction from the left of the hill, yet there were only three of them. On second glance however the group of four were back to the right of the cairn and walking towards us and the three they had seen some distance away had inexplicably disappeared. Considering we had a six-mile panoramic view of the area this was deemed as a mystery indeed. The group on returning said they had not seen any other walkers on the hill but they had heard a shout of “BARRY!” coming from our direction however, not one of us had called out to them. Time to descend the now perilously dark hill with its steep incline came, and cold, wet but with adrenaline keeping us enthused we trekked back down, head torches and the solar light trail we had placed on the way up lead us down safely to base camp, however our plans for a campfire were now disappointingly cancelled due to the inclement weather. That night Linzi and I snugged down in our three-man tent, grateful to be warm and cosy again and with ear plugs to block out the howling wind, however a peaceful night’s sleep was not intended for me that night. I was woken by the sensation of two hands roughly shoving me from the outside of the tent. Disorientated, it took me a few seconds to remember where I was and I scrambled for the torch, finding myself pushed right over into Linzi. Taking out the earplugs revealed that the weather outside was still extreme and it was just after 3am. Call me a wimp, but I had a creeping feeling that told me not to open the tent and I genuinely felt trepidation at the thought that what had woken me up was still lurking out there. I did manage to talk myself into the notion that I had dreamt the whole thing and managed to go back to sleep, only to be woken again not long after by a hard tap on my left foot. Linzi told me she had felt something push her also but she had managed to go back to sleep. Grateful for the morning light to come we were to soon find out that several others in our party reported the same thing happening to them also. 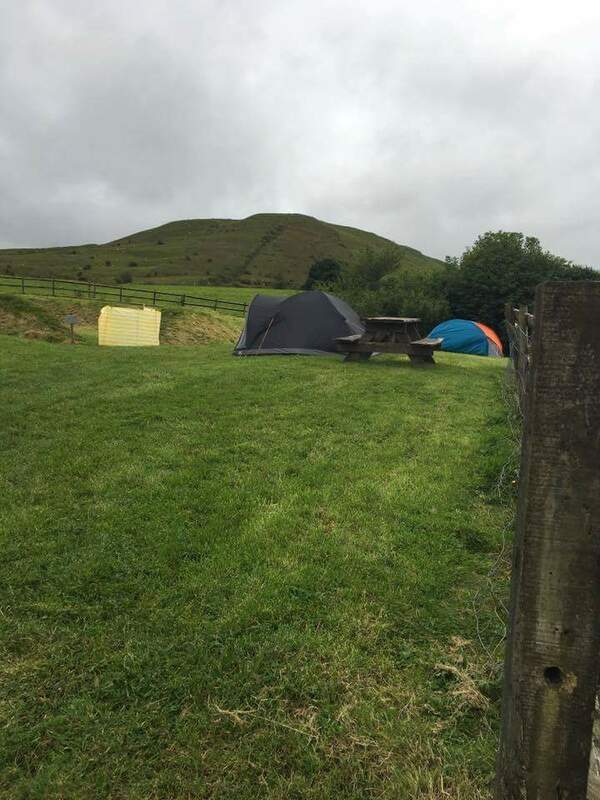 Barry recalled hearing strange footfall close to his tent, a two footed creature that made an unearthly breathing sound, unlike a fox or a badger, and oddly one that increased in activity each time the rain intensified. That afternoon we were party to to a three-hour long talk by Barry, in which he went into depth about the history of the Fae, and theorised about these entities, giving examples of why us as humans should respect their existence and not become involved in their affairs. Clearly Fae are not the depiction that Walt Disney might have us imagine, as he uncovered true life sightings and dark accounts, and he told of some recent accounts of consequences for those that crossed the line. That evening we had planned another hike to the top of Knocknashee Common, however the weather had yet again taken a turn for the worse, and this time it was unsafe to even attempt to climb the 45-degree hill, as thick fog rolled around the mountains and storms threatened high up on the hill, we decided that a campfire with ghost stories would be both safer and preferable. It was odd that the Irish elements had decided to grant us a clear and starry sky after about 10pm, when all around us I could still hear torrential rain, but who would question it as we were simply enraptured by the fireside tales told to us by Barry in his melodic Irish accent. A down to earth, honest man who is passionate about his vocation in which has travelled the world not only to appear in all 57 episodes of Ghost Hunters International, but to investigate and research and write several books about his experiences, and as a result he has countless stories to tell. We were truly captivated. After 1am, as the embers of our fire choked out its last sparks, four of the team retired to their tents. Two of them reported that they heard someone running up behind them on the gravel and assuming it was one of us not wanting to walk back to camp alone, they turned around only to find nobody there. The rest of us remained accompanied by the two dogs, Max and Evie who had remained sleeping soundly all evening beside the comfort of the fire, and they suddenly put up heckles, and began to growl at a dark area to the side of us, a small steep overgrown woodland area. The earth there was knotted with tree roots and wild ferns, and was fenced off to people and animals. This is where something strange happened, witnessed by seven of us, that we will never forget. One tiny light appeared in the woods… and then another. Soon we found ourselves watching a light show, and these were lights that danced and flickered, faded, flashed and rocketed like nothing I have ever witnessed before. These were not insects, moths or fireflies. I cannot find the words to describe it to you as a reader, as nothing I could say would give you a true enough depiction of what we were seeing. Perhaps this is because it was also accompanied by a sense, one that we were being shown something that was incredible. We didn’t have to go searching for the Fae, because they came to us. We did not rush to get our cameras because that would have meant missing a second of this supernatural spectacle that we had all come so far to find out about. During the activity we all were seeing dark much larger shapes moving closer around us on the ground, and as we shone a torch in their direction, they would disappear but these shapes were accompanied by a feeling of fear, enough to stop us following further – the dogs were certainly not happy, and this continued for about an hour longer. It has certainly changed something in my thought process. I have lost my eagerness for technical and elaborate ghost hunting equipment and my desire to get outdoors and sit quietly at nightfall somewhere quiet to observe something really supernatural for my own personal curiosity has been ignited. We are so obsessed with our electronic paraphernalia, iPhones and cameras and infrared this that and the other, that we have forgotten to use the finest piece of equipment we have. Our intuition and our senses. Our eyesight is limited; we only have a very small spectrum – so let’s not trust that alone. The hairs that go up on the back of your neck, the pounding of your heart when you walk into an area, the hesitation you get before opening a door or turning to look behind you? That’s your greatest tool. You won’t find me spending hours going through EVP footage much more, because from now on if I experience something then I will write about it, document it and tell my children about it. I want the folklore we have been gifted with to remain so that the stories don’t get lost in this world of congested, cynical and uninspired minds. Previous post: Poltergeist Phenomena: Mischievous Spirits or Misplaced Energy? Next post: SACRIFICE ALTER FOUND AT HOOBER STAND, ROTHERHAM? So beautifully told thank you. I do know fae exist – I have been looking for them for years. I can sense their presence but have learned they chose their time and place and situation. My first confirmation came as I visited a magical stone circle site with a friend , near Ballyvourney, Co.Cork. The place was truly mystical – one would not have to be clairvoyant to know it was teaming with elementals. I became so excited that I entered the circle without asking permission and without respect. On the way out I was given a mighty push from behind and fell heavily – hurting my arm. It took weeks to recover. I learned a valuable lesson. This spring equinox My friend and I made a flower essence from primrose beside a sacred site in Dingle. We took our neighbour’s children with us. We sang to the fae – the children played whistle and flute. A robin came and stayed with us for hours. I told the children if we could find a primrose with 6 petals it would be very lucky for us. The little boy found one right beside a tiny portal. As the flowers were providing their essence we asked if the fae would give us a sign I wish I could say I saw it but I didn’t. Instead the little boy became very excited – he said something flashed right in front of him – it was gold! Very lucky indeed. Did Sally Morgan FAKE her ghost video? 30 east drive GHOST 2019? This may be a good place to introduce yourself and your site or include some credits.